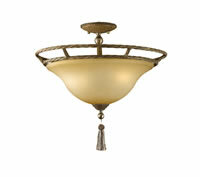 22207 - Uttermost Tessa 2-Lt Semi Flush Mount. Airy open curves of twisted rope arms are light and feminine. The silken tassel trim on each arm is an opulent touch; fresh and elegant. Fixture Type: Flush-Semi Flush Mounts. Designer: Carolyn Kinder. Number of Lights: 2. Wattage: 100W. Dimensions: 19 H (inches).